The Oklahoma redbud tree (Cercis reniformis) is a small ornamental tree that grows to 20 feet tall. It produces a multitude of pink, red or magenta blooms in the spring before the leaves appear. The redbud is the state tree of Oklahoma and is used as a landscape tree throughout the state. Redbud trees are related to peas, or legumes, and like peas have the ability to capture nitrogen from the air and store it in their roots. 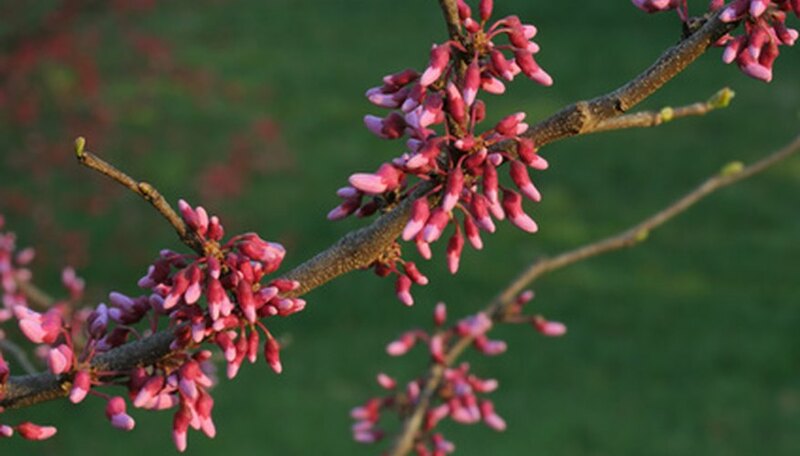 Therefore, the Oklahoma redbud needs little or no fertilization when grown in its native habitat. The leaves of the Oklahoma redbud tree are shinier and thicker than the leaves of common eastern redbud. Select a planting site in the landscape that receives full to partial sun. A location that gets full sun until midafternoon is best because redbud trees begin to show stress in late summer if they are exposed to the hottest afternoon sun. Redbud trees can be spaced according to the landscaping style. They can be planted as close together as 6 feet if planted en masse. However, if you want each tree to grow into its true form, space the trees at least 15 feet apart. Dig a hole, using the shovel, that is deep enough for each tree to be planted at the same depth it was previously planted or is planted in the container. If planting a bare root tree that does not have a container, look for the soil line at the base of the trunk. Plant the tree deep enough that the soil in the new hole is at the same line. Dig the hole so that it is three times the width of the root base of the tree you are planting. This breaks up the soil and gives the root system the ability to quickly spread and not become impacted or encircled, which can eventually kill the tree. Take each tree from its planting container and place it in its planting hole, spreading out the roots carefully. Add the same soil that was removed from the planting hole, mixing it with water as you go. By creating a mixture of water and soil, a seal is formed around the roots of the tree against air pockets that could allow the roots to dry out. Add a 1- or 2-inch layer of mulch over the surface of the soil around the root base of each Oklahoma redbud tree. Leave a 1-inch space between the mulch layer and the trunk of the tree. This prevents any fungus or mildew problems from spreading from the mulch to the tree. Keep the area around the trees moist, but not wet, until the trees are established. Trees USA: Redbud, Oklahoma "Oklahoma"